On Top Roofing will be with you every step of the way. Here is what you can expect from us, Start-to-Finish. We survey the roof and the immediate area(s) affected by the roof for potentially problematic issues, this includes ventilation Inspection of the attic. Our inspection includes rot Inspection; there are many different stages of rot. Once rot has started it can be stopped by proper ventilation (unless it is past a certain point). If you properly ventilate the moisture and heat will have a place to escape. A hot attic allows the snow on your roof to melt unevenly and freeze at the eaves, water will then dam and eventually leaking will occur. Then, we write up a detailed estimate and take the time to review and explain our findings with you. If necessary, we will put together all paperwork possible for Insurance Companies and work with Adjusters. Make sure that all personal items are out of the way or protected from potential harm during the roofing process. This includes protecting shrubbery, plants, decks, moving lawn furniture, and/or other items from the immediate vicinity. Our crew will remove the existing roofing material. The deck surface, and any other wood, will be inspected for damaged or rotten wood. Different materials require surface products such as tar paper or other materials to be laid over the deck surface before installing your shingles or other roofing material. 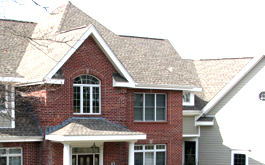 Installation of your shingle or other roofing material. With most roofing installations, we will need to replace metal flashings such as drip edge, wall flashings, and chimney or skylight flashings. The shingle installation starts at the eaves and our crews work their way up to the ridge. Cleaning happens during all parts of the process and final clean up of all protective materials and finishing touches to the area. When your project is completed and inspected we will do a final walk-through and at that time, discuss your warranties, billing, and maintenance tips.